Your throw pillows should be soft, comfortable, and add style to your home. Our throw pillows inserts are cut from soft white 100 % cotton fabric that's tightly woven - to keep its shape and last for years. We don't skimp on the fill either, and oversize our pillow inserts to ensure that your beautiful coverings look and feel like a million bucks! FABRIC - 100% Cotton - 230 thread count, "down proof", in pure white. FILLS - 25% Down + 75% Soft Feather: light and soft with good shaping and support characteristics, and Polysilk™ - down alternative fiber: "hugably" soft and silky. 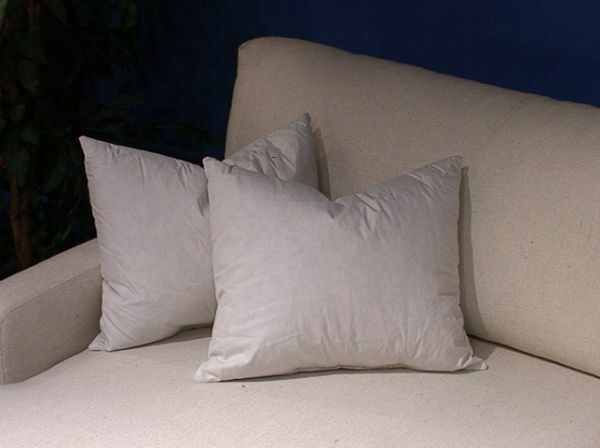 CARE - Remove pillow insert from upholstered fabric, spot clean and air dry. PACK / SHIP - Clear plastic bag in corrugated box. We make every effort to minimize your shipping cost including vacuum packaging and putting multiple products in each shipping container.